Asbks is our first man out in A-Team Special (I)...! Sorry bud! Asbks made A-Team Special History, as the first one to be eliminated ever in this Tournament series! Location: I love a good plan, and i just love it when a plan comes together! Last edited by CJ Lues on Sun Apr 15, 2012 4:53 am, edited 1 time in total. First team through to round 2! 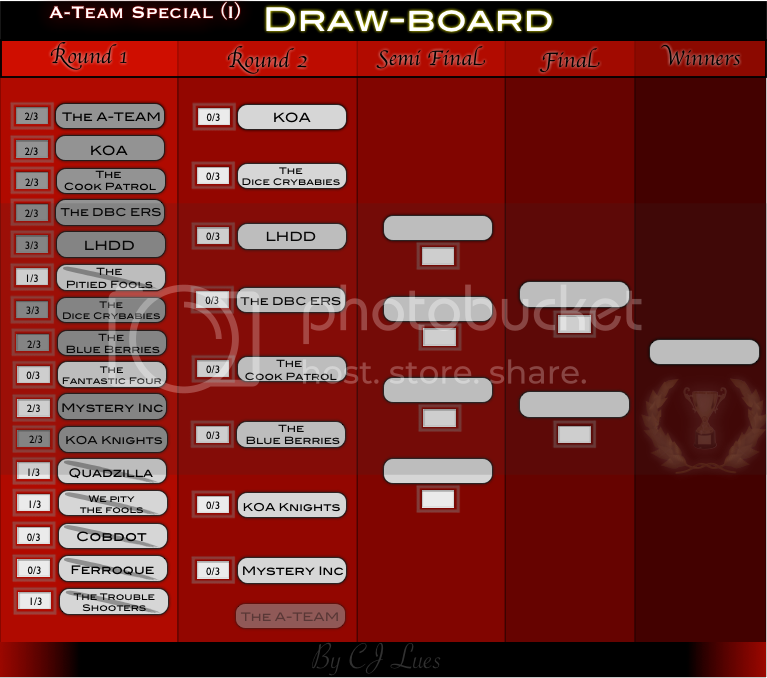 Team KOA is marked as KAO in Draw Board... mostlikely a typo. If possible can you change it to KOA. Interested in clans? Check out the Fallen! 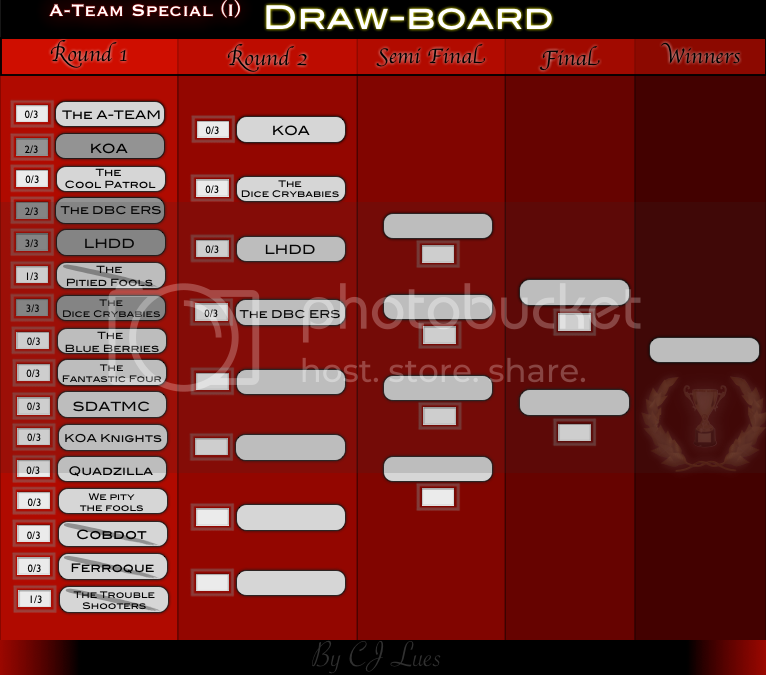 GoranZ wrote: Team KOA is marked as KAO in Draw Board... mostlikely a typo. If possible can you change it to KOA. Sure! Sorry about that mate! Last edited by CJ Lues on Thu May 03, 2012 7:10 am, edited 1 time in total. We have all the teams for round 2 to start! 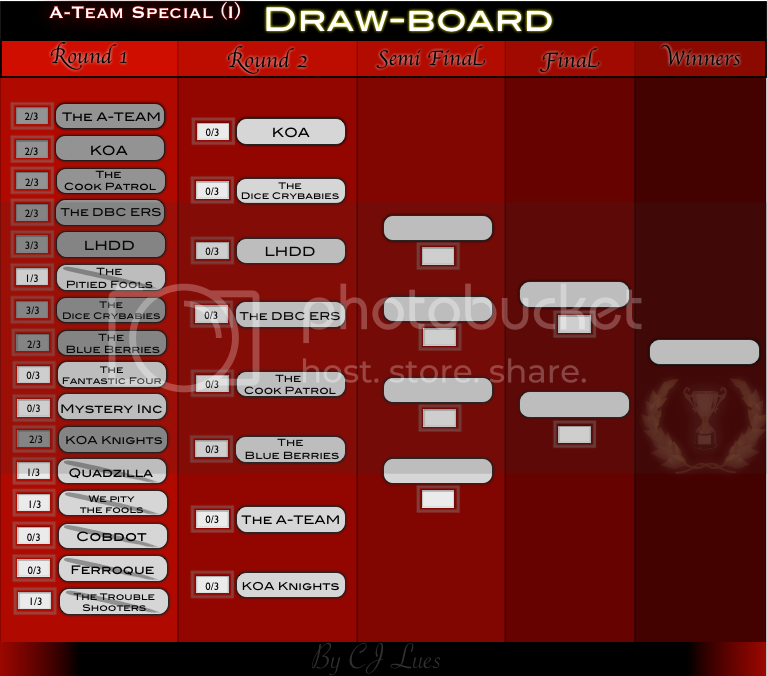 CJ Lues wrote: We have all the teams for round 2 to start! Premium and Freemium are allowed to join, but, you must have 3 open games if you are Freemium. I will send out invites to all participants, I will only send out one invite, you have 24 hours to send me a PM, asking me for a second invite, if you fail to send me a PM within the time or miss the second invite, everyone will be forced to withdraw from the game and the other team will be granted that game's win! So, The A-Team hereby volunteers to step down from the A-Team Special (I) Because there is no easy way to get a winner from 9 Teams the way this tournament is run. To prevent this in the future: I will divide the 16+ teams into four groups for Round 2 and two groups for Round 2, the two winners from each group will advance to the next Round. CJ Lues wrote: Your point GoranZ? CJ Lues wrote: So, The A-Team hereby volunteers to step down from the A-Team Special (I) Because there is no easy way to get a winner from 9 Teams the way this tournament is run. I dont agree with your(or your outside sources) solution about the issue... I will propose something else instead(since invites are already sent etc...). As far as I noticed only best 2 teams go in next round so does it really matter if one of the groups has 4 and the other has 5 teams in it? Its less drastic measure then one team to quit. On top even statistically teams from both groups will have equal odds for advancing. Personally I rather play 1 more game then other team to play 4 games less. IDK what other teams think but I bet that my teammates will agree with me. Weren't these games supposed to be foggy? macbone wrote: Weren't these games supposed to be foggy? still trying to get the hang of all the things! If the games should be foggy, they should probably be remade and the sunny games shouldn't count. And you should really have a different solution than kicking your team out of the tournament. A tiebreaker of some kind. chapcrap wrote: If the games should be foggy, they should probably be remade and the sunny games shouldn't count. Yes that is the right thing to do. Objections anyone? chapcrap wrote: And you should really have a different solution than kicking your team out of the tournament. A tiebreaker of some kind. Believe me, it is not that easy! It's a tough call. On the one hand, an error in the creation of the tournament should probably go against the drafter if possible AND if there aren't any better solutions. Here, I don't really see a better solution as there were no tiebreaker criteria beforehand. Can you think of a tiebreaker criteria that doesn't hurt the remaining teams unfairly? I can think of 2 tiebreaker criteria that could be used and both of them could unfairly hurt another team. First, is a playoff among the 2-1 teams. I believe this is unfair because it (1) prolongs the tournament for everyone else and (2) hurts teams that may have taken less care after going 2-0 and "knowing" they made it through to the next round. The second criterion that I've seen used in this type of tournament is a total number of rounds played standard. This rewards you for quick kills and/or slow losses. But again, a team may have played a slower grind-it-out game to ensure the victory, but might have taken more chances had they known this was how ties would be broken. In the end, I commend CJ for making that tough call. I think it's the exact right call that a TO should make in this situation. A less honorable TO might have tried to arrange the tiebreaker criteria in a way that would have benefited his team. This happened because I did not now I had to divide the teams in groups and let the best 2 of each group advance to the next round, so I just randomly placed the 16 teams against each other... So technically it's my fault. I learned that the hard way...! Luckily I have an awesome team that understands...! Tiebreakers aren't that hard... Slowing the tournament a little is fine. And agent saying that people took it easy because they were 2-0 is just silly. Who doesn't still try to win? I don't care if you kick your team out. It that's what you want to do, you can. But, you should have a tiebreaker in place. Also, I declined an invite to a sunny game...again. I'll wait for the foggy games. #1 Due to requests I am going to remake the games of Round 2 into Fog games (sorry for any inconvenience), none of the Sunny games in Round 2 will count towards the final victory. Because we now only have 7 teams in round 2, I allow The A-Team back in the A-Team Special (I). Last edited by CJ Lues on Fri May 18, 2012 9:40 am, edited 1 time in total. I never said we don't try to win. I said "take less care." I'm just talking about how people balance priorities. I'm in several games with these folks across several tournaments. If we were 1-1 in a series and knew that advancing depended on winning that game, I would spend more time on that game making sure that I made the exact right move. Same thing, say, if we were in a finals match. And I would expect my teammates to do the same. In a perfect world, every teammate would seriously scrutinize every move in every game. But people have other things going on and may speed through a casual game, if they're running out the door or trying to go to sleep. Do you seriously treat all games equally? If so, that's pretty impressive. I try to, but if we've already advanced in a tournament round, I'm not going to be as likely to PM my teammates for advice--not when there are several other games that I'd rather they pay close attention to.